They have your back, so give back. 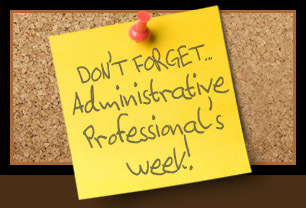 This year's edition of Administrative Professional's Week, or APW, is coming up fast. From Monday, April 22nd to Friday, April 26 it's time to remind your right arm how important the work he or she does is to you. Integrity: We demonstrate this cornerstone of our profession through honesty, accountability and high ethical standards. Respect: We create respect within our profession and association through listening, understanding and acknowledging member feedback. Adaptability: We ensure the success of our association by embracing positive change and by nurturing diversity, creativity and visionary thinking. Communication: We cultivate and maintain excellence by remaining approachable at all levels, communicating openly and building strong relationships. Commitment: We are steadfast in our goals to develop learning opportunities for career-minded administrative professionals and to strengthen efficiency and effectiveness. So next time you close another deal successfully, remember who had your back, and give back. The Flower Pot has a few great ways of showing appreciation to all Admin Pros. Check out our Administrative Professionals Week section for gift ideas. Looking for inspiration or recommendations? Call us at 514-938-1234 or visit us!